It’s a grey and soggy day outside. The kind of day that makes you wish for a soft blanket, a warm cat and a hot cup of cocoa to accompany that great page-turner of a book you’d been meaning to read all this time. It’s definitely the kind of day to run the oven for a while. However, don’t forget the dressing. It just wouldn’t be the same without the lemony-garlic tanginess. 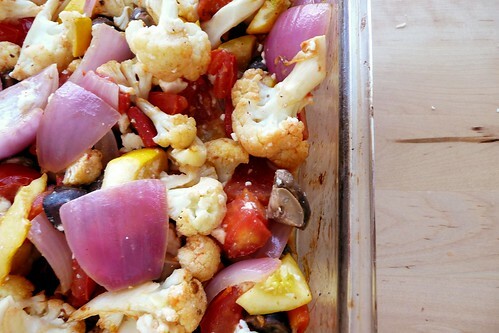 Toss all veggies with olive oil, rosemary or thyme, salt and pepper and arrange in a single layer on a sheet pan. Roast for 25 minutes. 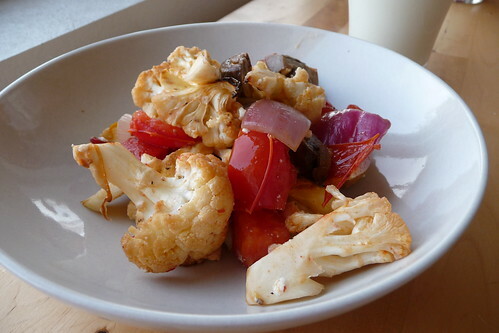 Toss roasted veggies with vinaigrette and sprinkle over with feta cheese and parsley. Serve. For potatoes: Prior to roasting the veggies, toss potatoes with olive oil, rosemary and garlic. Arrange potato mixture in a single layer on the sheet pan. Roast for 30 minutes, stirring once. Remove from oven and follow Veggie Salad instructions above, making sure to combine veggies and potatoes well. For orzo: Just prior to putting the veggies in the oven, bring liquid to a boil in a saucepot. Salt the water and add the orzo, bringing it back to a boil. Reduce heat to low, cover and simmer for 25 minutes while the veggies roast. Strain orzo and combine with veggies before serving. This entry was posted in dairy-free, gluten-free, recipes, salad, sauce, side, untranslated, vegetable, vegetarian. Bookmark the permalink.